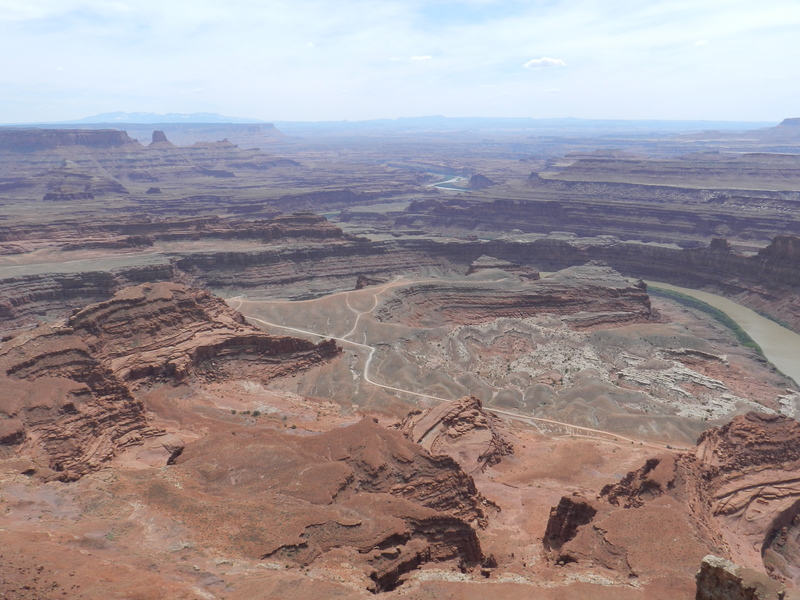 About seven miles of hiking trails navigate the rim rock and desert plateau landscape of Dead Horse Point State Park, connecting eight different overlooks. 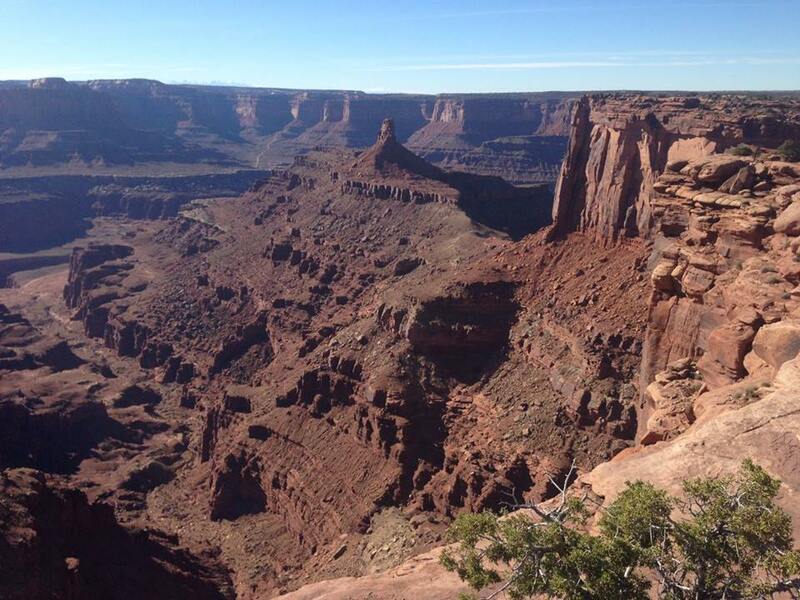 All trails are relatively easy in nature, traversing the mesa top with minimal elevation gain or loss. 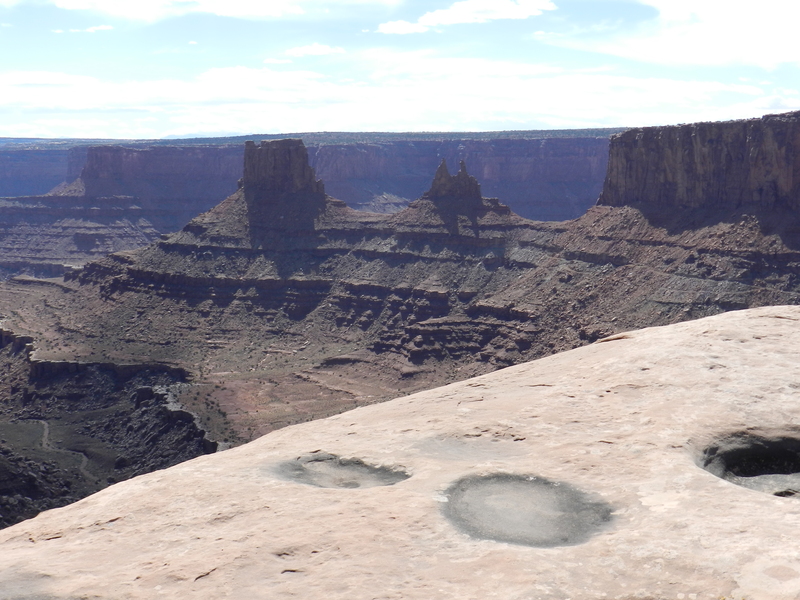 Because of uneven slick rock, however, sturdy footwear is highly recommended. Dogs are allowed on hiking trails, but must be kept on leash at all times. 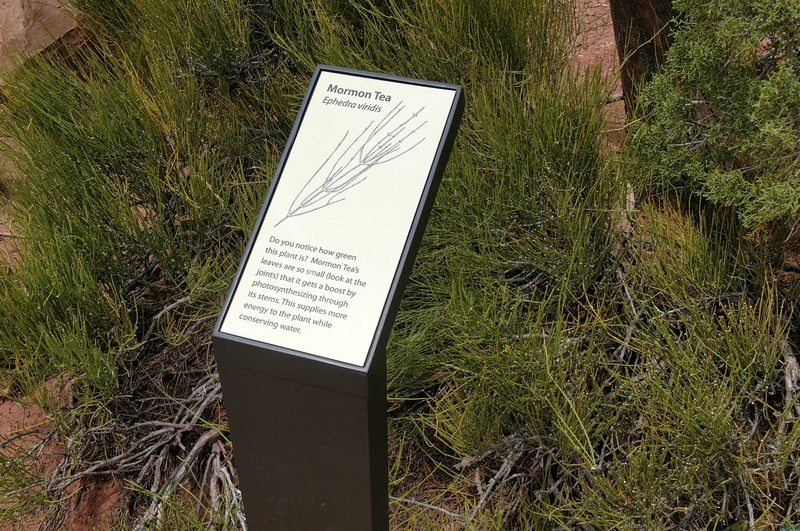 To learn more about our trail network, keep reading below or follow one of these links for a virtual tour. 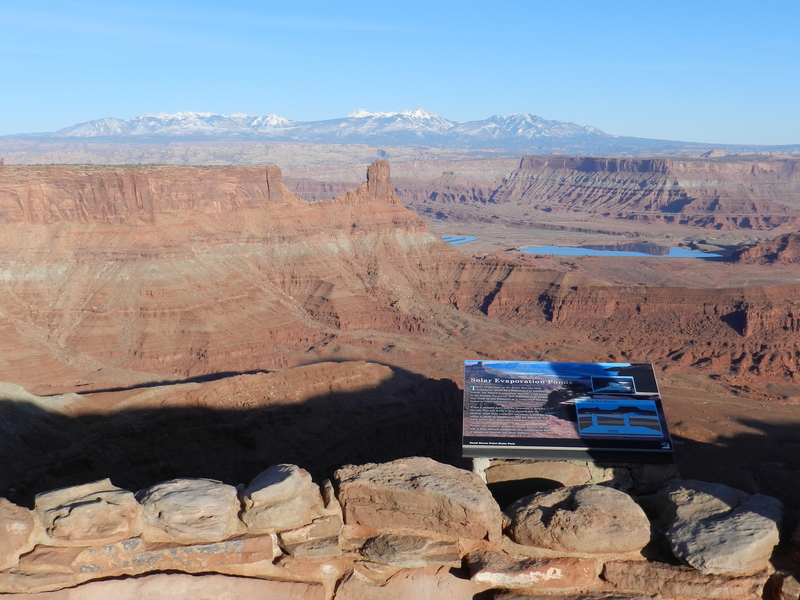 This is the main attraction of Dead Horse Point State Park. 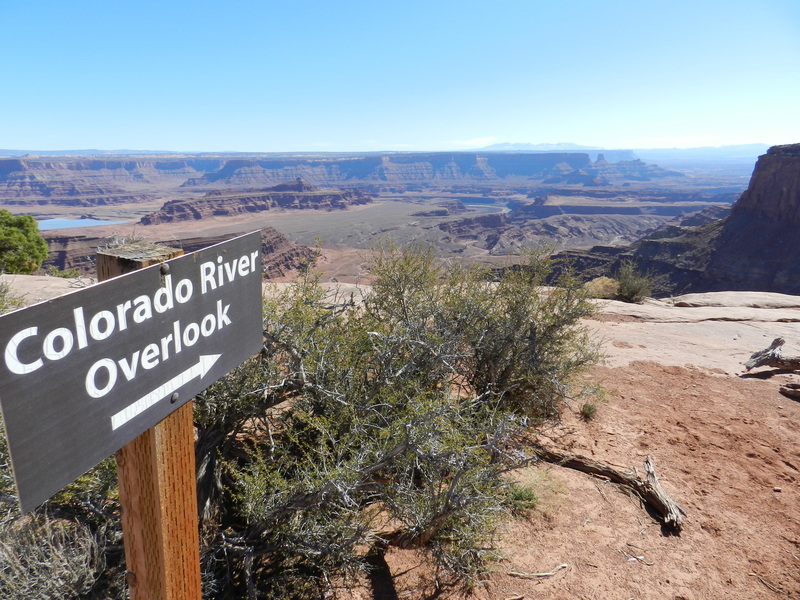 From the overlook parking lot, a short paved pathway leads to breathtaking views of the Colorado River and adjacent canyon country some 2,000 feet below. 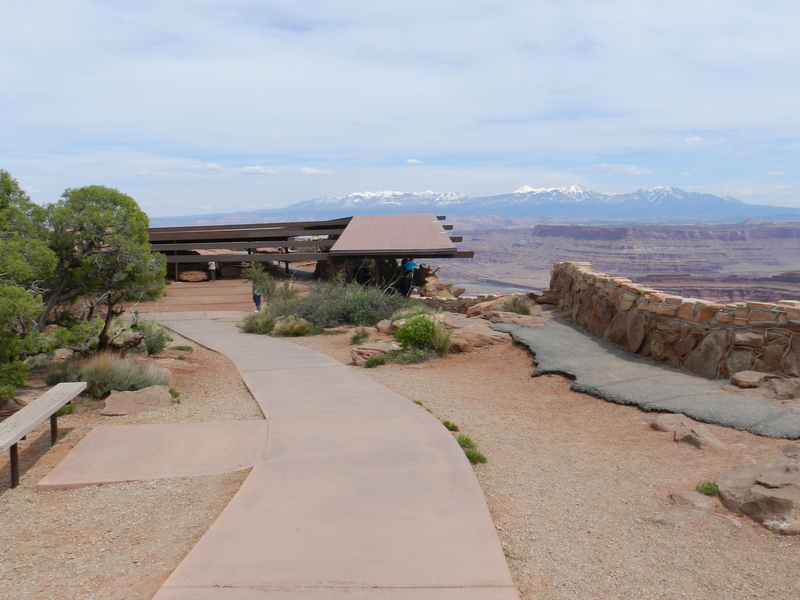 A large shelter at the overlook provides relief from both foul weather and summer heat. 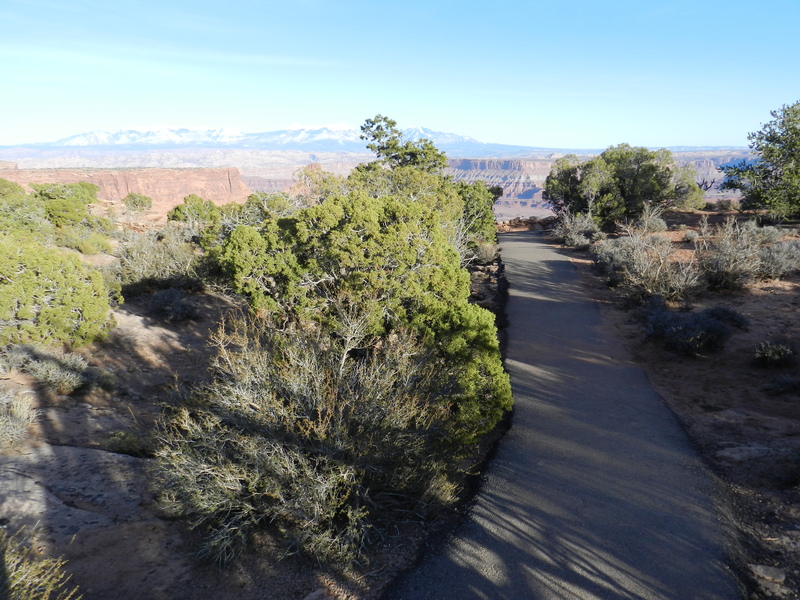 Paved pathways lead out in both directions from the shelter, providing additional viewpoints while linking up with both the East and West Rim trail systems. 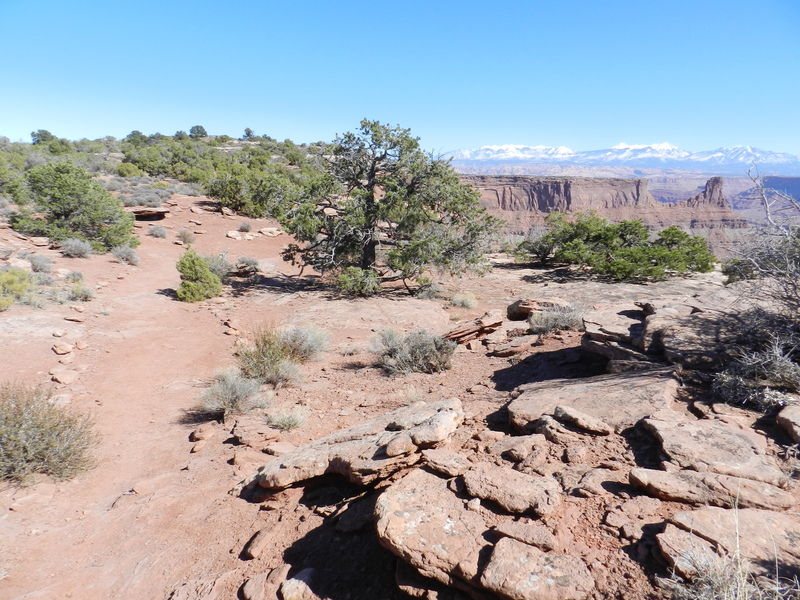 Although the primary overlook and shade shelter are accessible, the eastern and western spur trails contain steeper inclines and short sections of slick rock interspersed with the pavement. 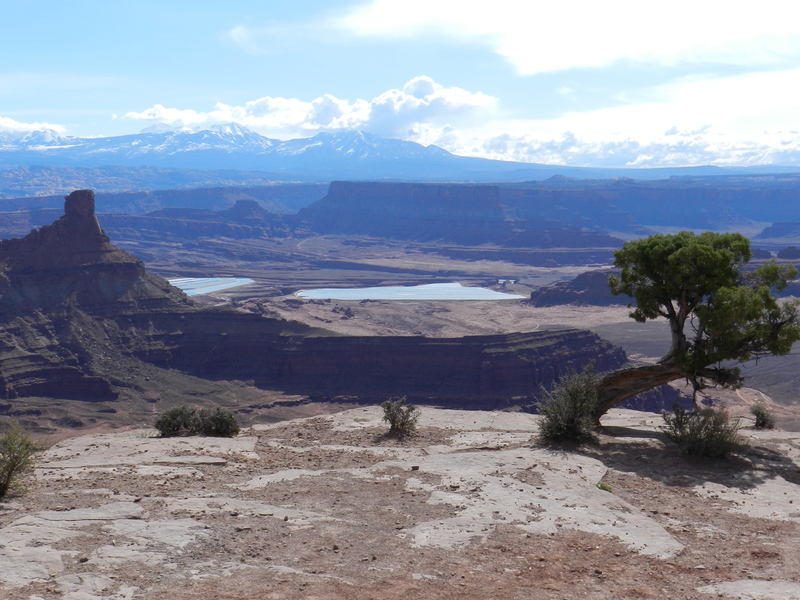 The paved path just outside the Visitor Center offers great views of the basin to the east, the La Sal Mountains and Chimney Rock. 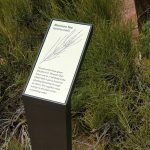 Eight trail-side exhibits highlight some of the common desert plants and trees that you’re likely to encounter in the park, while an interpretive sign explains a unique feature that can be seen from many of the East Rim overlooks: solar evaporation ponds that are used in the mining of salt and potash. 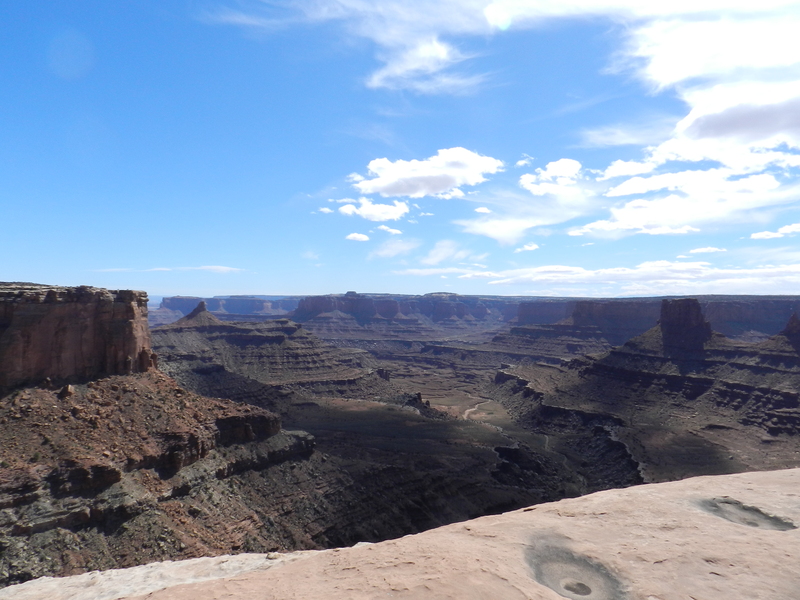 This trail winds north from the visitor center, skirting along the east rim to a view of the Colorado River. 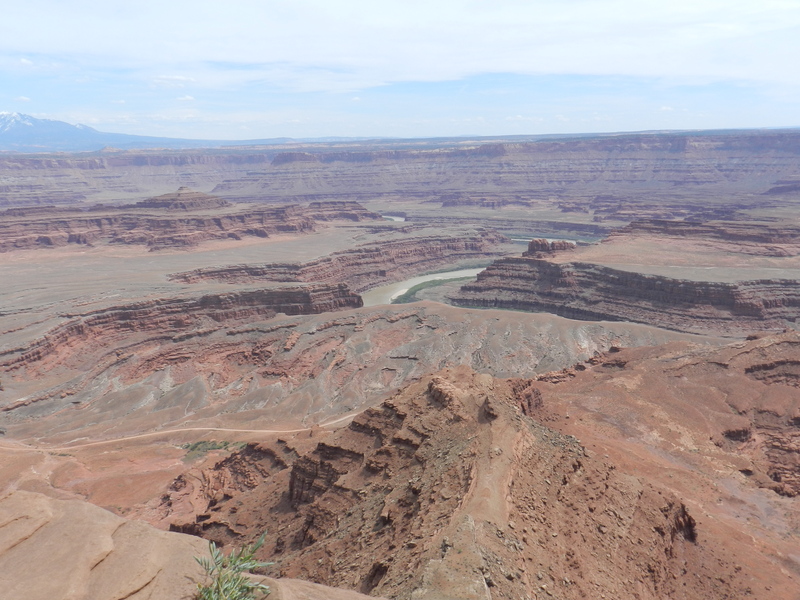 The view from the Overlook is a great way to see erosion at work as the basin descends to a massive S Curve in the river. 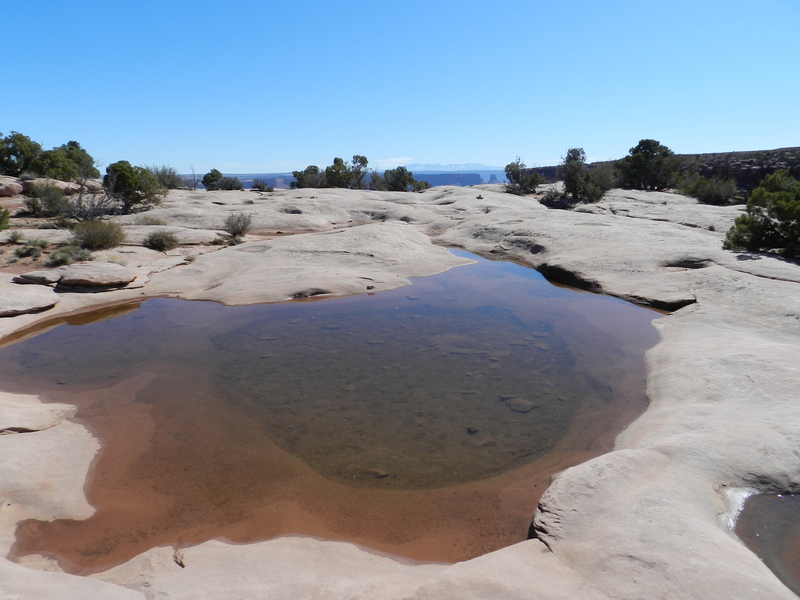 A series of large potholes (seasonal pools of water) and juniper-pinyon forest make this trail great for seeing wildlife as well. 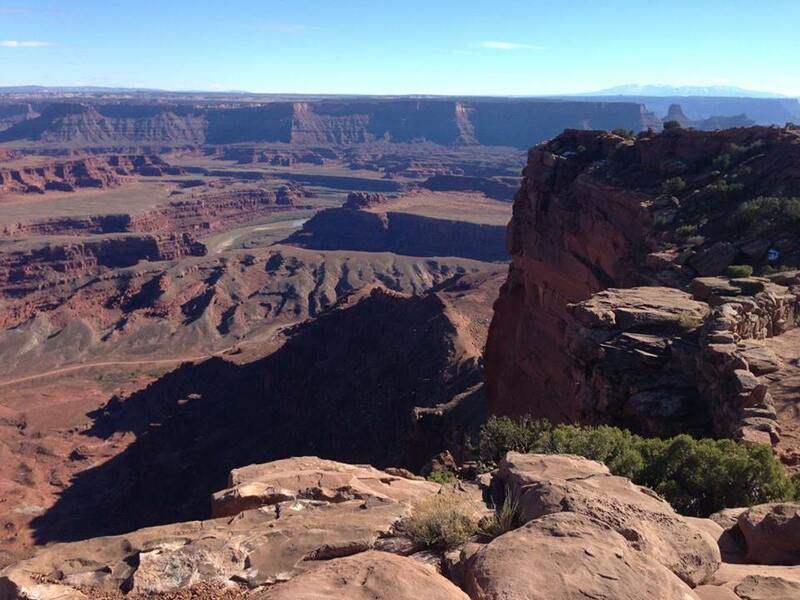 This trail begins at the visitor center and travels along the eastern side of the mesa top to Dead Horse Point, providing a fun hiking alternate to simply driving the main park road. 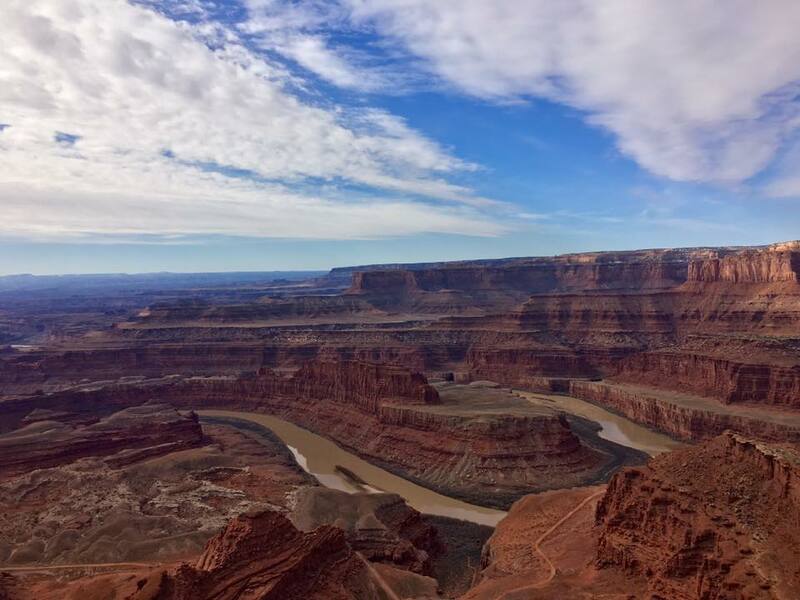 The East Rim offers great views towards the La Sal Mountains and Behind the Rocks area as well as sagebrush flats and juniper forest. 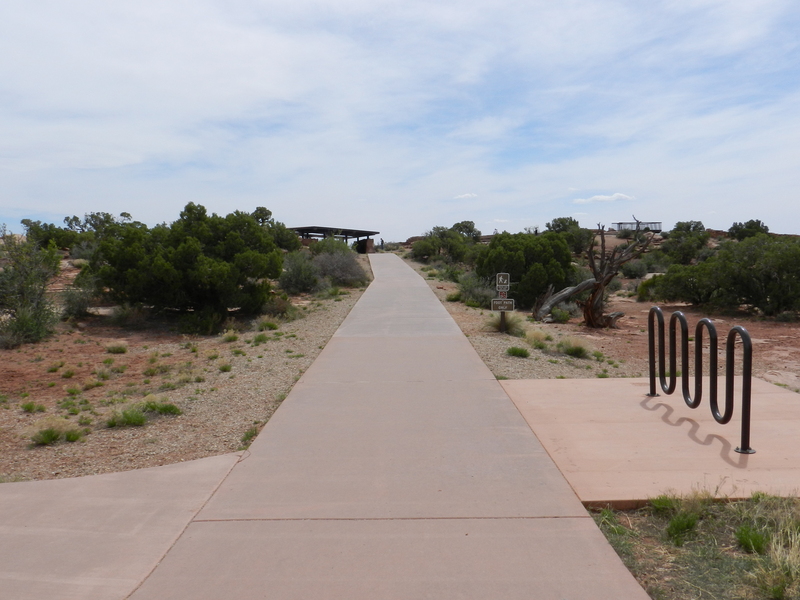 Aside from a short hill a quarter mile from the visitor center, this trail is predominately flat. 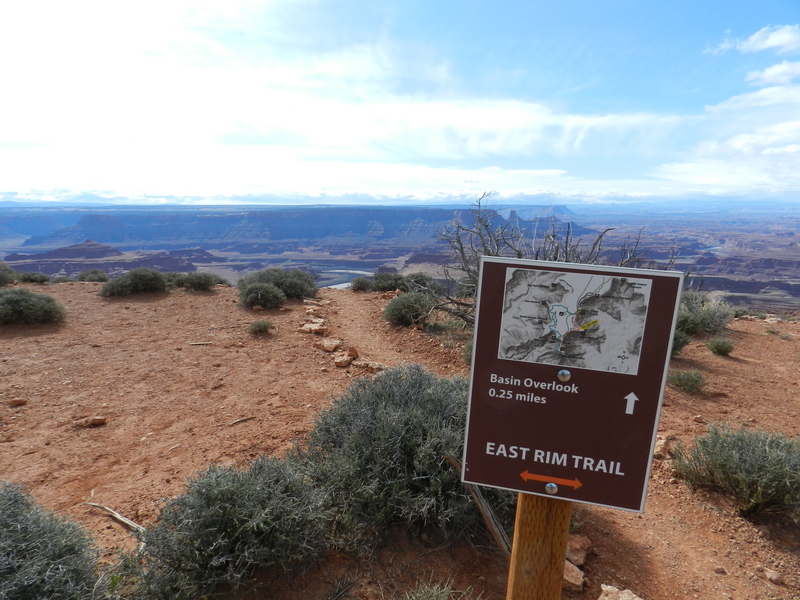 A loop of this and the West Rim Trail makes a great 4-mile (or more), half day adventure starting and stopping at the visitor center. 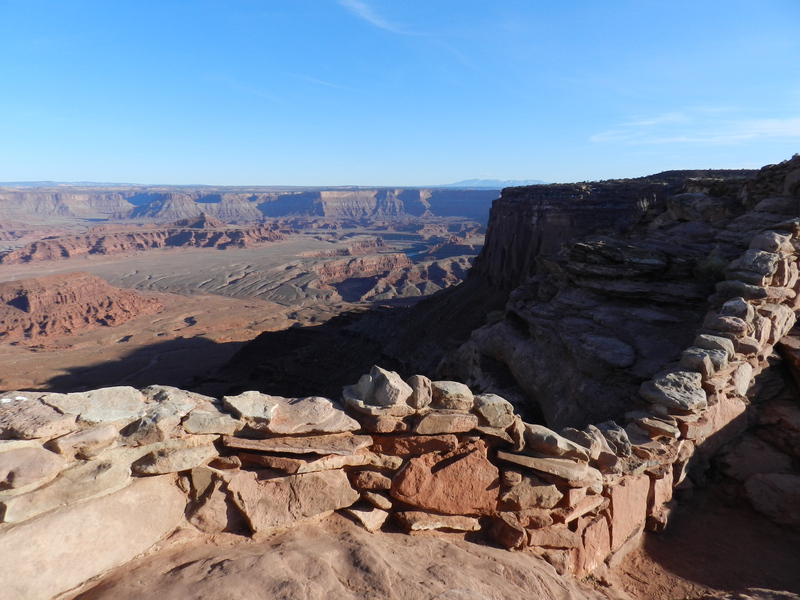 By itself, the East Rim Trail amounts to 1.5 miles between the visitor center and Dead Horse Point. 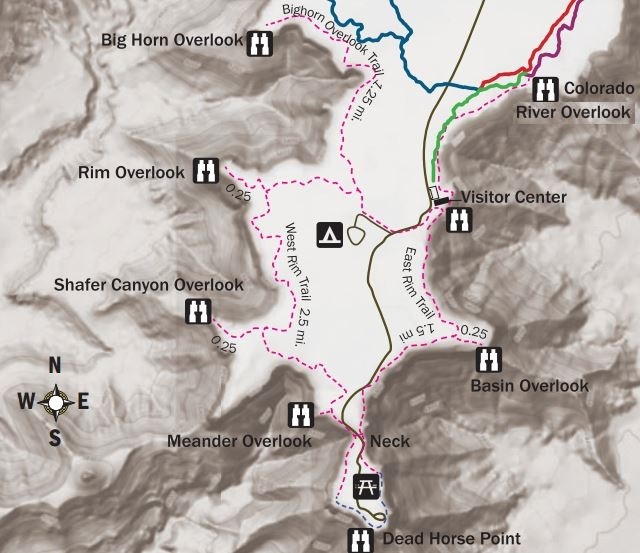 An additional half-mile can be added by taking the Basin Overlook spur. 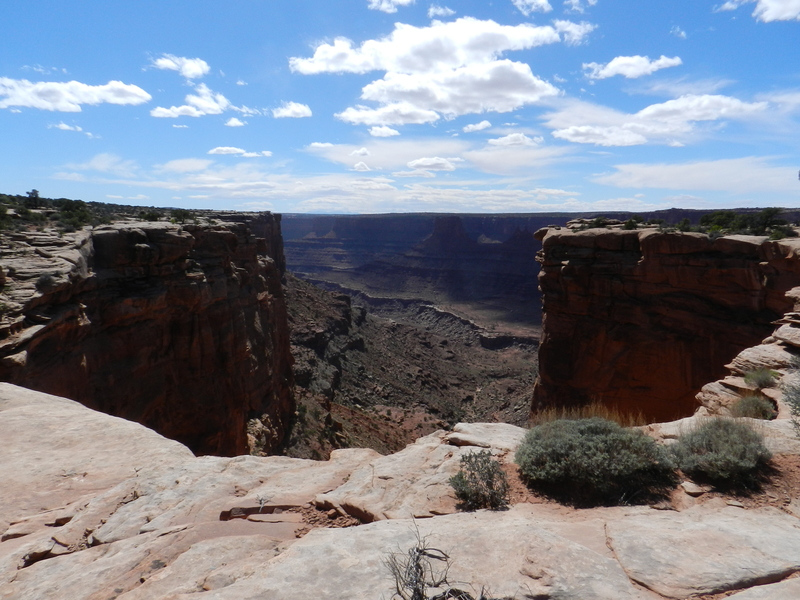 This side trail quickly drops about 100 feet off the mesa top to a shelf that offers spectacular, and typically more secluded views of the canyon country below. 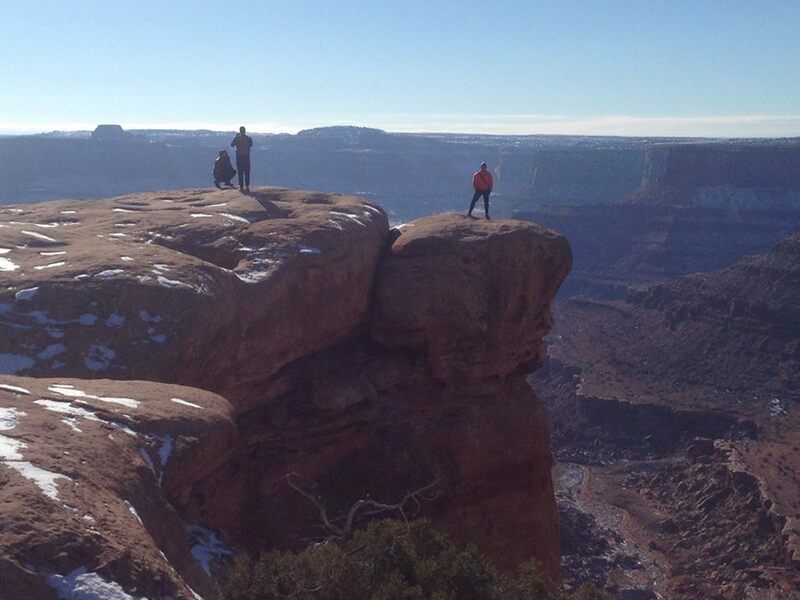 The West Rim is the longest hiking trail at Dead Horse Point State Park. 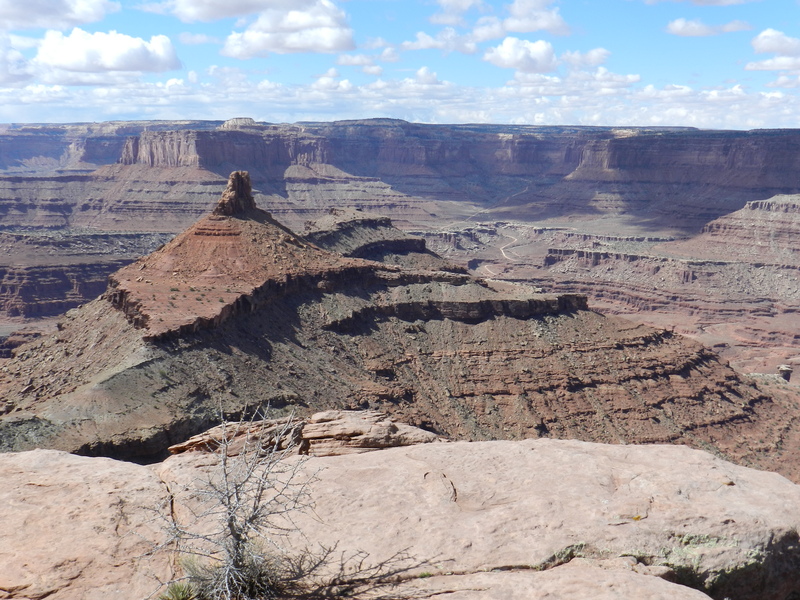 From the visitor center, the route crosses the road and passes briefly through the campground before following the cliffs that form the western boundary of the park. 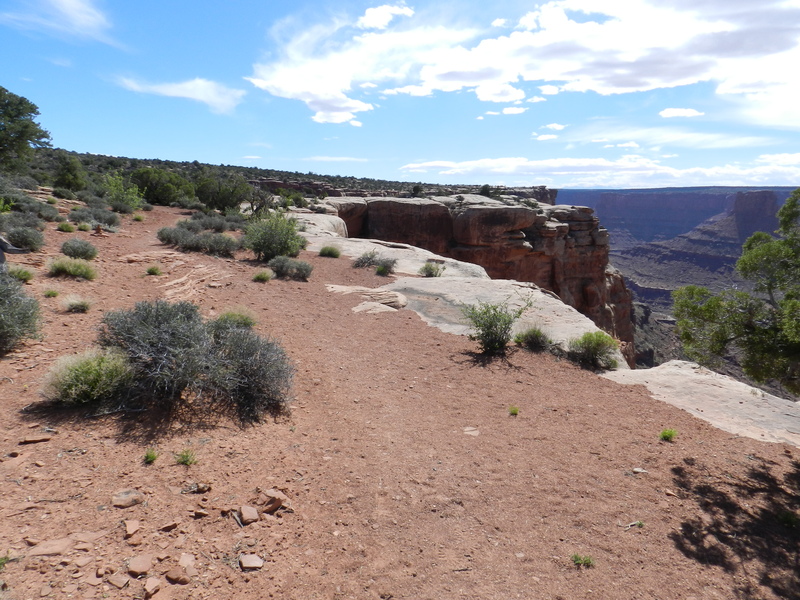 This trail is more primitive, and usually less traveled than the East Rim. 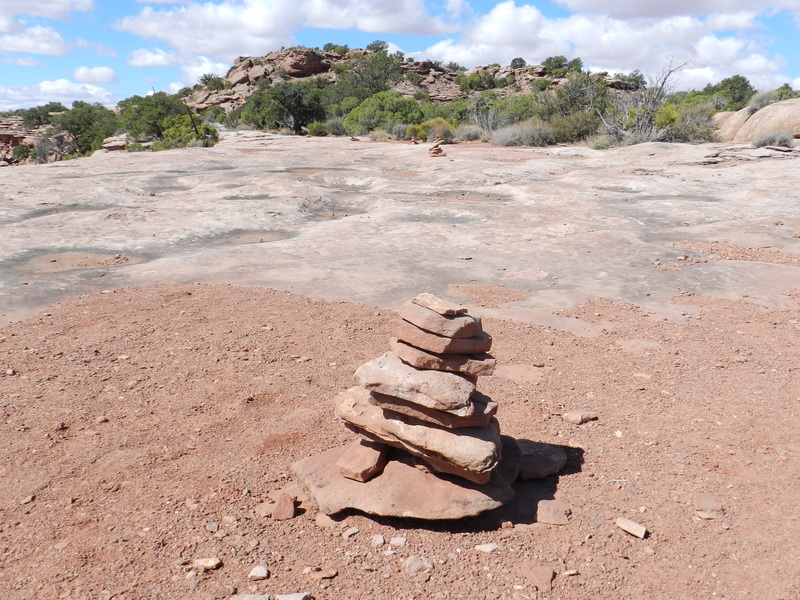 Make sure to follow the cairn-marked routes over exposed sections of sandstone and slick rock. 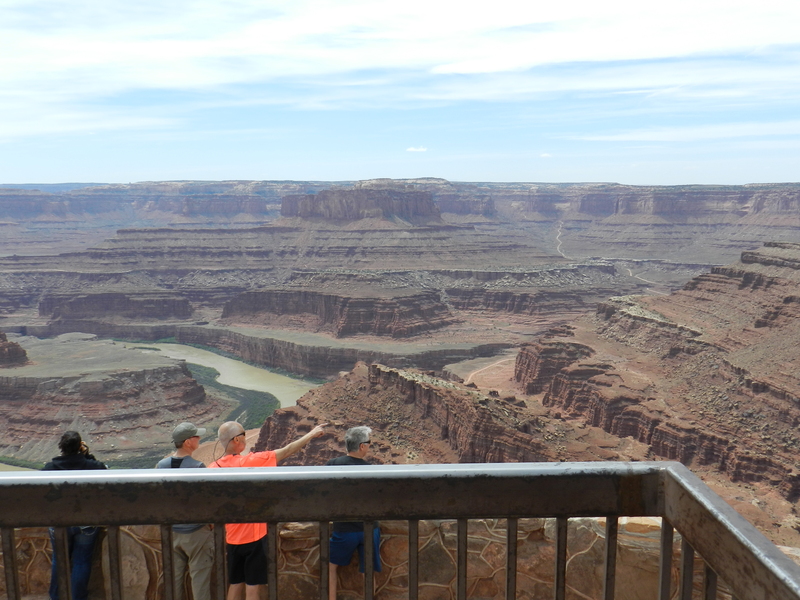 The Meander, Shafer, and Rim overlook spur trails add an additional mile to the trek while affording sweeping vistas of Shafer Canyon and the Colorado River. 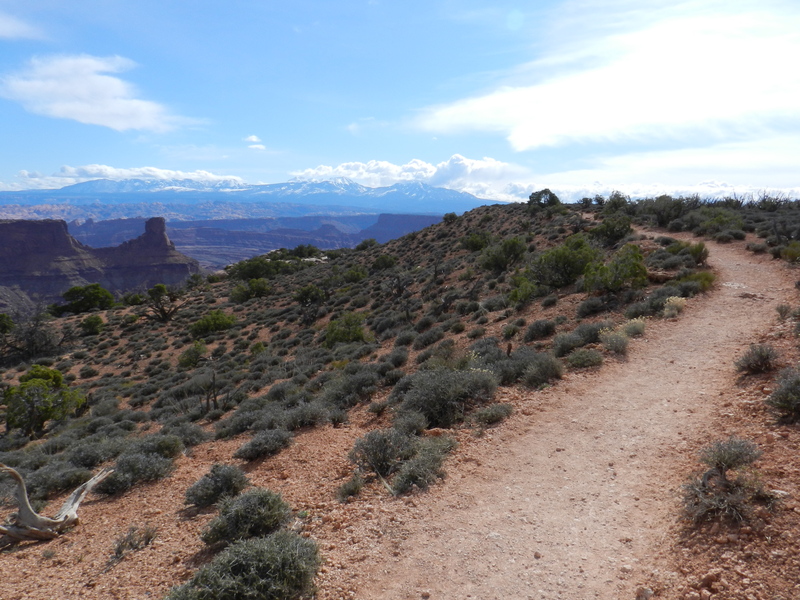 This is the longest spur off the West Rim Trail, branching off to the north from the vicinity of the campground. 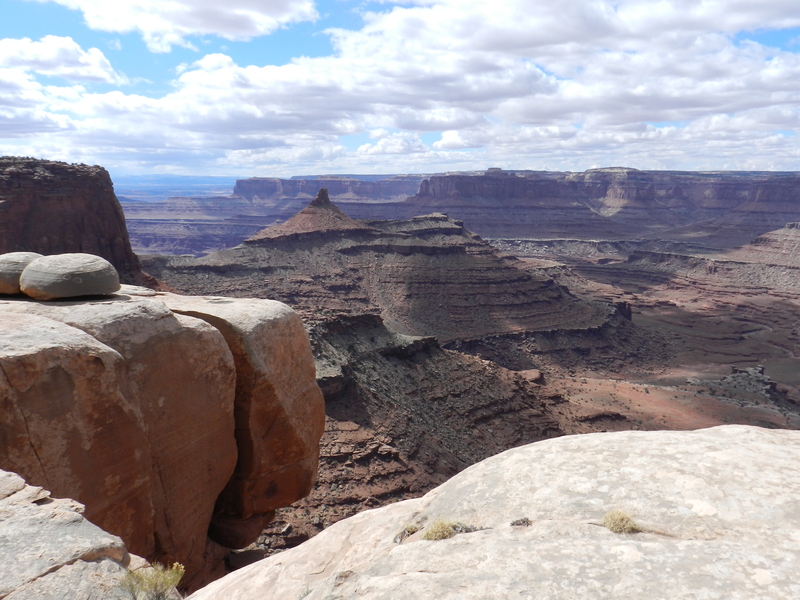 Because of its isolation (you may well be the only group on the trail) and the fact that its views rival those of Dead Horse Point itself, this trail can be considered a destination of its own. 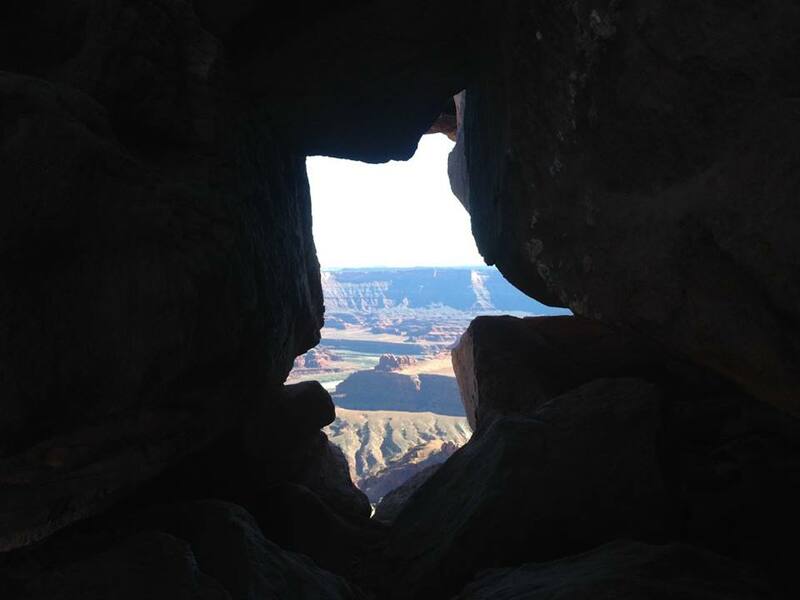 The overlook is named for an eroded fin that can be seen in the distance, resembling a pair of horns. 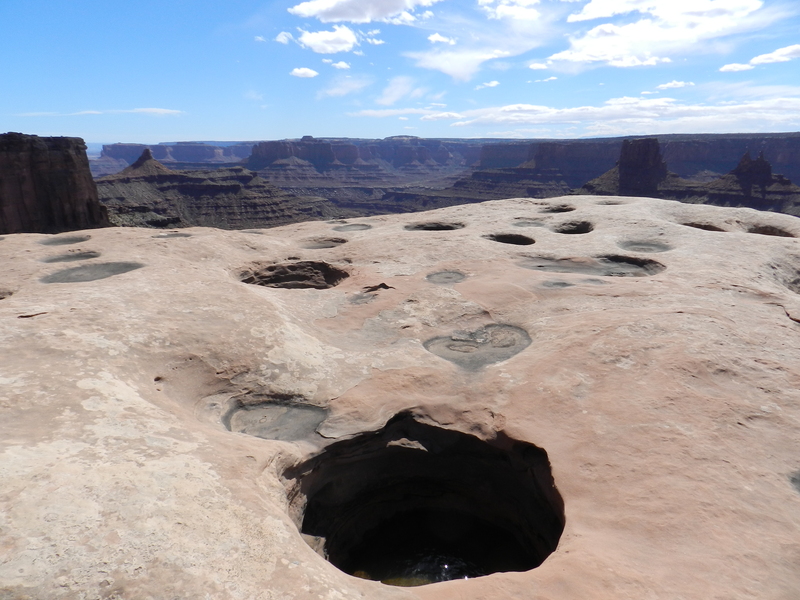 The end of the trail is also home to a series of very deep potholes which, when filled with water, can be teeming with fairy shrimp, tadpoles, and other forms of life. Like the other West Rim trails, this route often follows cairns across stretches of slick rock. 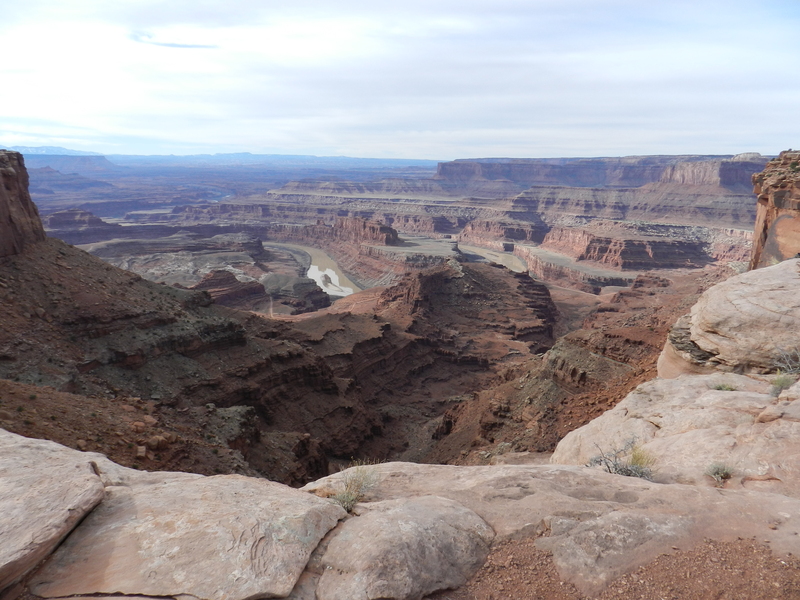 There also are short sections of moderate cliff exposure, especially at the overlook itself where there are no guardrails. Caution and sturdy footwear are advised.